33 x 25 cm, 20 pages, two columns, black ink. The Freewoman was one of the first self-consciously modernist little magazines in England. Under the leadership of Dora Marsden and the financial backing of Harriet Shaw Weaver, the magazine hosted discourse and debate about issues including the suffrage movement, marriage, divorce, motherhood, prostitution, and sexual repression. The Freewoman’s pages focused on the language that shames women and sexuality. For example, they supported substituting “passion” for “lust” and published a series of articles in May 1912 that equated marriage with legal prostitution. Throughout its run, the magazine was politically driven, yet feminism did not retain the dominant political position. In May 1912 the magazine shifted subtitles from The Freewoman: A weekly feminist review to The Freewoman: a weekly humanist review. At the same moment, the magazine shifted away from feminism and towards anarchism in response to criticism by Upton Sinclair and H.G. Wells who found few organized theories in feminism. Amidst the competing interests of the feminist movement and the male-dominated anarchism, readership dwindled. The magazine closed in October 1913, but Marsden succeeded it with The New Freewoman in June 1913. In the first issue of The Freewoman, Dora Marsden sets forth the purpose of the magazine in the “Notes of the Week” section. “Notes of the Week.” The Freewoman. 1:1 (Nov. 23 1911): 3. Dora Marsden was born the fourth of five children on March 5, 1882 in Yorkshire, England. After the family woolen waste manufacturing business declined, her father emigrated to the U.S. and left his wife and four of his children including Marsden in England. Education was Dora Marsden’s path out of familial dependence and the beginning of her feminist awakening. After working as a teacher in her adolescence, Marsden graduated from Owens College in 1903. She again worked as a teacher until 1909, when she resigned and became a paid organizer for the Women’s Social and Political Union, a group focused on the suffragist movement. From 1909 to 1910 authorities repeatedly arrested and imprisoned Marsden. 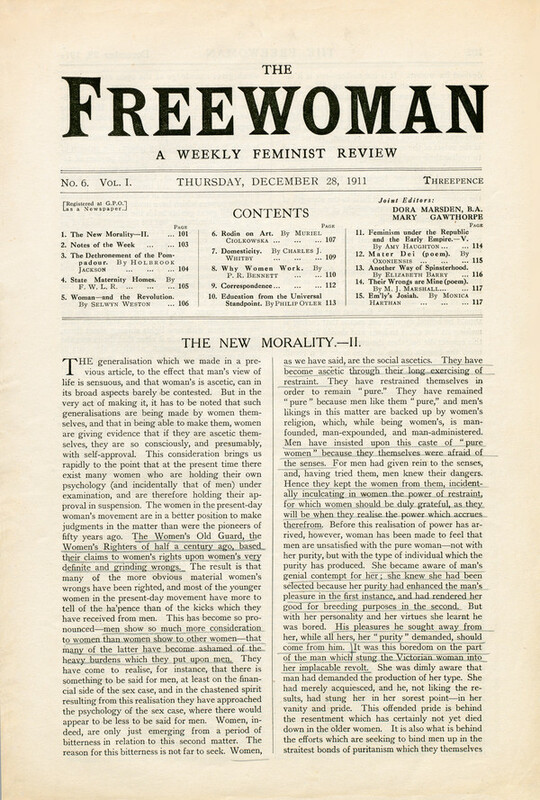 After resigning from the WSPU, Marsden edited and published The Freewoman: A Weekly Feminist Review. Under her leadership the magazine transformed from The Freewoman, to The New Freewoman, and finally to The Egoist. From 1913 onward Marsden became less political but worked with The Egoist until its collapse in 1919. In 1920 she moved to the Lake District and became increasingly reclusive. With the help of Harriet Shaw Weaver, Marsden published two volumes (in 1928 and 1930) of her philosophy. These volumes were poorly received, and she suffered a mental breakdown in 1934 and attempted suicide in 1935. She became a patient at Crichton Royal Hospital until her death in 1960 (Oxford DNB Vol. 36 777-778). Brooker, Peter, and Andrew Thacker. The Oxford Critical and Cultural History of Modernist Magazines. Oxford: Oxford University Press, 2009. Vol. 1, 11. Print. Clarke, Bruce, and Sharon Stockton. “Dora Marsden and Early Modernism: Gender, Individualism, Science.” Clio 27.2 (1998): 320. Print. Drysdale, C V. Freewomen and the Birth-Rate. London: Printed by Hazell, Watson & Viney, 1911. Internet resource. Fernihough, Anne. Freewomen and Supermen: Edwardian Radicals and Literary Modernism. , 2013. Internet resource. Garner, Les. A Brave and Beautiful Spirit: Dora Marsden, 1882-1960. Aldershot, Hants [England: Avebury, 1990. Print. Matthew, H. C. G., Brian Harrison, and British Academy. Oxford Dictionary of National Biography : In Association with the British Academy : From the Earliest Times to the Year 2000. Oxford: Oxford University Press, 2004. Vol. 36. 777-778. Print. West, Rebecca, and Jane Marcus. The Young Rebecca : Writings of Rebecca West, 1911-17. New York: Viking Press, 1982. Print. “You Might Also Like . . . : Magazine Networks and Modernist Tastemaking in the Dora Marsden Magazines.” The Journal of Modern Periodical Studies. 5.1 (2014): 27-68. Print.